This full-length marble statue of the composer George Frideric Handel (1685-1759) was commissioned by the entrepreneur and collector Jonathan Tyers, who ran Spring Gardens at Vauxhall in London in the mid-18th century. Handel was then a leading figure in the capital's musical life. Since public life-size marble statues of living subjects were until this date undertaken only for monarchs, noblemen or military leaders, this figure made a considerable impact at the time. It is the earliest-known independent work by Roubiliac, and established his reputation as a sculptor. Louis François Roubiliac (1702-1762) was trained in Lyon, later working in Dresden under a leading Baroque sculptor, Balthasar Permoser (1651-1732), and then studying in Paris before moving to London in about 1730. All his known surviving works were executed in Britain. He specialised in portrait busts and funerary monuments, and was renowned for his handling of marble, particularly his creation of subtle surface textures. Vauxhall's Spring Gardens flourished during the 18th century. Set up and managed by Jonathan Tyers (1702-1767), it was a fashionable meeting place for Londoners, with supper boxes, promenades and live music (some of it composed by Handel). Works of art were prominently shown, with paintings by Francis Hayman (1708-1776) adorning the supper boxes (covered booths for dining) and marble sculptures set out along the avenues. Tyers is thought to have commissioned these partly to enhance the respectability of the Gardens, which had gained a somewhat disreputable air due to the increasing nocturnal presence of courtesans and common prostitutes. Statue, marble. 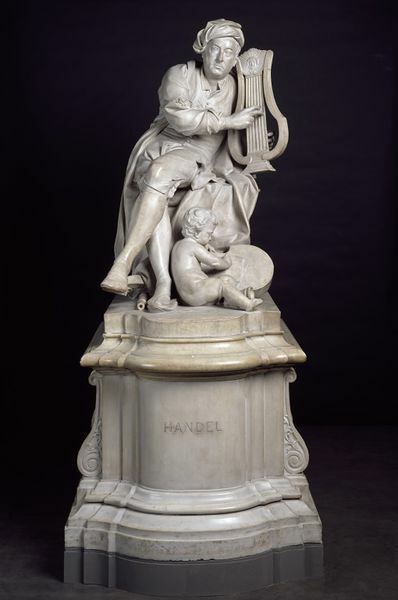 Handel is seated cross-legged and leaning to his right, playing a lyre. His left elbow rests on a pile of bound scores of his works, titled ALEX FEAST, OPERAS, ORAS and LESSONS. He wears informal contemporary dress, a soft cap, a long shirt open at the neck and buttoned to below the waist, loose breeches, stockings and slippers, one of which has been discarded and lies beneath his right foot. He has also a full loose gown, covering the seat and falling to the ground on either side of his legs. At his feet on his left is seated a putto, who is inscribing the notes Handel palys on paper propped against a viol, while to the left on the base are a flute and an oboe. It was commissioned by Jonathan Tyers and placed in the pleasure Gardens at Vauxhall in 1738 in a Grand Niche, in the Grove, where it remained for nearly 80 years. The figure is last recorded in the Grove behind the Orchestra in 1813. Following the death of Tyers in 1767, management of the Gardens fell to his two sons, Thomas and Jonathan. In 1809 the gardens came into the possession of George Rogers Barrett and the Revd. Jonathan Tyers Barrett, D.D., and in 1818 on the death of George Barrett, the responsibility of the gardens passed to Dr Jonathan Tyers Barrett, whose attempt to sell the gardens in 1818 was unsuccessful. Before the sale of Vauxhall Gardens, the 'Handel' was removed to the Stockwell home of George Rogers Barrett, shortly before his death. Around 1818 the figure passed to Jonathan Tyers Barrett, and was placed in the front hall of his house in Duke Street, Westminster. The death of Tyers Barrett in 1830 resulted in the sale of the figure by Mr Christie, King Street, London on 28 April 1830, lot 80. The 'Handel' was again sold in 1833 by Mr Squibb of Savile Row to 'the sculptor and marble contractor', Joseph Brown of University Street, London, for £215 5s. Purchased by the Sacred Harmonic Society from Joseph Brown in 1854 for 100 guineas; a pamphlet published by them in 1854 recorded its recent purchase. The marble plinth on which this figure is now displayed was almost certainly made at this time. The statue was displayed in the Society's offices in Exeter Hall, Strand, London until 1880 when it moved premises. The figure was moved to the offices of Novello and Company at 1 Berners Street, London, as was later purchased by Henry Littleton, chairman of the company. It remained in his possession at his Sydenham home for about twenty years; it was then given by his son to Novello and Company, where it remained at 160 Wardour Street from about 1906 to 1964, until its purchase by the Museum in 1965. Purchased from Novello and Company Ltd in 1965 for £10,000 with assistance from the National Collections Fund. Whinney, M, Sculpture in Britain 1530 to 1830 (revised by J. Physick), London, 1988, second edition, pp.1998-9, fig. 135 and p. 400. Jervis, S, 'A River God by Caffiéri', National Art Collections Fund Annual Review, London, 1993, p. 81. Draper, J.D, 'A Statue of the Composer Grétry by Jean- Baptiste Stouf', Metropolitan Museum of Art Bulletin May 1970, p. 378, fig. 2. Sophie in London, 1786; being the diary of Sophie v. la Roche translated by C. Williams, London, J. Cape, 1933, p. 280. Bindman, D and Baker, M. Roubiliac and the Eighteenth Century Monument, New Haven, 1995, p. 49 and fig. 28. Wimsatt, W.K, The Portraits of Alexander Pope New Haven and London, 1965, pp. 225, 227. Solkin, D.H. Painting for Money New Haven, 1993, p. 112. Bignamini, I, 'Art Institutions in London 1689-1768', The Walpole Society LIV, 1988, p. 104. Allen, B, 'The Landscape' in Vauxhall Gardens, (exh. cat. ), Yale Center for British Art, New Haven, 1983, pp. 18, 19, 21, 22. Beresford, E, The Lives of the British Sculptors London, 1911, p. 114. Brewer, J, The Pleasures of the Imagination. English Culture in the Eighteenth Century, London, 1997, p. 225 and fig. 138 on p. 376. Ogborn, Miles. Spaces of Modernity: London's geographies, 1680-1780, New York, The Guilford Press, 1998, pp.116-155. Allen, B, Francis Hayman New Haven, 1987, pp. 35, 91 and fig. 17 and 18. Corfield, P.J, Vauxhall and the Invention of the Urban Pleasure Gardens, Mitcham, 2008. Baker, M, 'Tyers, Roubiliac and a Sculpture's fame: a poem about the commissioning of the Handel Statue at Vauxhall', The Sculpture Journal, vol. II, pp. 41-45. 'Minor Topics of the Month', Art Journal, 1 July, 1855, p. 217. Pointon, M. Milton and English Art, Manchester, 1970, p. 46. Craske, M, The Silent Rhetoric of the Body New Haven, 2008, pp. 153, 121, 160 and 419. Coke, David, 'Roubiliac's Handel for Vauxhall Gardens: a sculpture in context', Sculpture Journal, Vol. 16.2, 2007, pp. 5-22. Williamson, Paul, The NACF and the National Collection of Sculpture. In National Art-Collections Fund Review,1986, p. 81, fig. 5.